Author Jonny Bowden looks at what he calls 'The Four Horsemen of Ageing'—free radicals, inflammation, glycation, and stress—and shows how they can harm your health and shorten your life in The Most Effective Ways to Live Longer. More and more studies are proving that we can strongly influence how long and well we live. 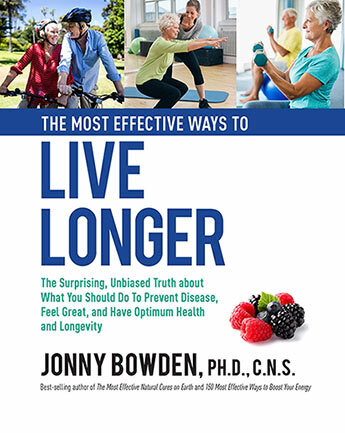 Jonny offers the smartest program for living a longer, healthier, better life. Jonny Bowden, PhD, CNS, (Woodland Hills, CA),also known as The Nutrition Myth Buster, is a nationally known, board-certified nutritionist and expert on diet and weight loss. He has appeared on the Dr. Oz Show, Fox News, CNN, MSNBC, ABC, NBC, and CBS and has contributed to articles in the New York Times, Forbes, the Daily Beast, Huffington Post, Vanity Fair Online, Men's Heath, Prevention, and dozens of other print and online publications. He is a popular speaker who presents at both academic and consumer events all over the world.